"My order arrived last Thursday. It's a work of art. Thank you!" "Well I have to say I am thoroughly surprised and impressed by your response. I was anticipating a messy interaction to get this sorted out. I sincerely appreciate you being on my side and doing everything you have done to remedy the situation. I own two businesses and understand the value of customer service and sometimes having to go out of your way to make something right, and I sincerely appreciate that in what you have done for me. Thank you again for all your help, you have made a frustrating experience pleasant again." "Just wanted to let you know that our order arrived in perfect condition. Thank you so much for superb customer service! We will definitely recommend your company to our friends! Happy Holidays,"
"Awesome Price and Awesome Service. I ordered on a Tuesday with the Free Shipping option and I received the Volleyball Net on Thursday. I would have no problem purchasing from them again." "This transaction was excellent and it was delivered and shipped as agreed. Top notch quality and great customer service!!! Hope to do business again." "I received this order in just a few days. The service was excellent and the quality of the product is great." "We were very pleased with our shuffleboard purchase and would recommend your store to others. The board came packed well so that nothing was damaged. Delivery was quick and everything went well with the purchase." "I was very pleased with the way everything was handled. After I put in the order, I remembered that I had a business trip planned the following week.I was thinking that I would not be there to receive the package, so I emailed your company to see if you could hold it one more week before sending it out.I received an immediate response telling me you would wait 7 days to ship it. 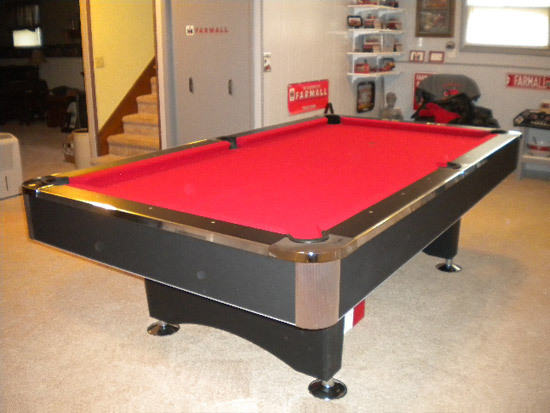 Thanks,"
"You company was very helpful in purchasing the 3 for 1 mahogany bumper pool table for my family who were very excited at Christmas to receive. The tabletop woodwork was beautiful, the poker table looked professional and the pool table was velvet green. The construction of the table went seamlessly." "Received the scoreboard for 12' Grand Hudson shuffleboard table completing our order. What a beautiful shuffleboard!!! Thanks!" "Thanks John for the great customer service." "Please tell your shuffleboard table carvers I said Thank You, I received and set up my table yesterday. In all it was 1-1/2 week delivery. Can't beat those "made to order" tables." "I am not a big purchaser of items on the internet, but the experience I had with Gaming Tables Online was awesome. They are a top notch operation where customer service and customer satisfaction is paramount, matching the quality of there products. When I ever need another game for my game room, I am going back to Game Tables Online!!!!!" - D. Marquez - Purchased 12' Intimidator Shuffleboard Table, Level Best 54" 3 in 1 Dining, Poker and Bumper Pool Table, and Carlyle Foosball Table. "Well John, Thank you Sir!!!! I will let you know how it looks. As you know, your great service and quality products are the big reason I tell others of Gamestablesonline.com I appreciate what you are doing for me. " "Gametablesonline has provided excellent customer service of their products, leaving us very satisfied with our purchase!" 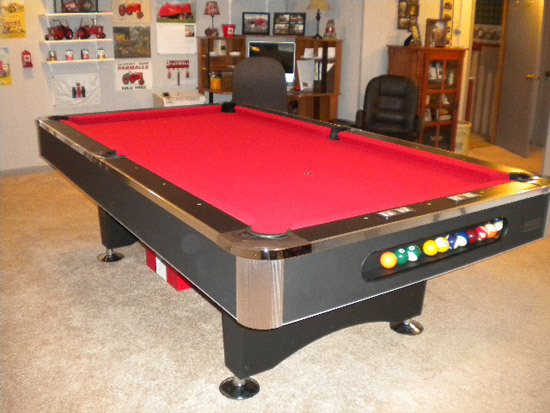 Customer purchased the 8' Imperial Black Pearl Pool Table with ball return and 8' leisure grade red felt"
"The pool table arrived in perfect condition. The leveling took no time at all. The big test was 1) setting the 4 ft level across the middle to the side pockets. PERFECT. We knew then that it is a great table. 2 small adjustments needed because of my stone floor, and then the next test. We placed a billiard ball right in front of each pocket and none of them moved an inch. My installers and I were so excited. They told me that the pallet this one came on was as poorly constructed as the first one, but they worked with the carrier on how to lift the table top without putting excess strain on the middle of the pallet and the middle of the table top since the pallet did not provide enough support. They left the pallet at the carrier’s terminal for disposal. Thanks to you personally and Gametablesonline.com and Imperial International for sticking with the issues until a satisfactory resolution. You are all a class act. I will reflect these sentiments on my survey submission. This is really a great table. Even the installers were impressed with how well the billiard balls rolled on the outdoor cloth. They said that they will recommend this brand of outdoor table if any of their customers ask. They told me when they were setting up the first one that it looks elegent. I agree. Thanks again. It is now time to break out the Sam Adams!" "Thanks for perseverance and follow up on this. Nut received today and installed. Appreciate the follow through on such a small item"